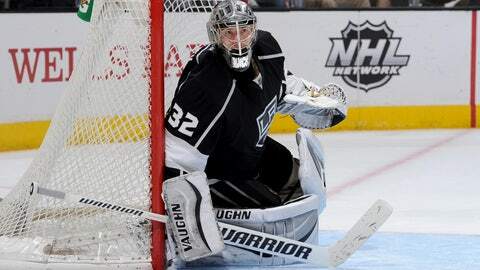 LOS ANGELES (AP) — Jonathan Quick broke the Kings record for wins by a goalie, making 24 saves in his fifth shutout of an injury-hampered season as Los Angeles beat the Florida Panthers 4-0 on Saturday. Trevor Lewis, Mike Richards, Alec Martinez and captain Dustin Brown scored for the Kings, who completed their five-game homestand with back-to-back wins after three straight one-goal defeats. Quick earned his 172nd career victory and surpassed Rogie Vachon, one of five players to have his uniform number retired by the club along with Marcel Dionne, Dave Taylor, Wayne Gretzky and Luc Robitaille. The shutout was the 30th of Quick’s career, two shy of Vachon’s franchise mark. Vachon was in the arena for the record-breaker. Los Angeles scored on three of its first 13 shots against three-time All-Star Roberto Luongo, who finished with 25 saves in his seventh start since returning to the Panthers in a trade with Vancouver. Lewis opened the scoring at 11:03 of the first period, beating Kulikov to a loose puck in the low slot and whipping it past Luongo’s stick after Willie Mitchell’s wrist shot from the right point struck teammate Kyle Clifford in front of the crease. It was the third goal in seven games for Lewis, who had only two in his 55 previous games this season. Jonathan Quick is now the winningest goaltender in #LAKings’ history. Richards made it 2-0 at 17:16, just 13 seconds after the Panthers killed off a hooking penalty against Sean Bergenheim. The Kings’ center got the puck in the right circle from Lewis, skated parallel to the goal line and put his 10th goal between Luongo’s pads. Brown added his 12th goal at 8:54 of the second, slipping the puck through the legs of Kulikov and into a wide-open net with Luongo out of position. Seconds earlier, Kulikov was tripped by Brown after carrying the puck away from the left boards. Martinez’s power-play goal capped the scoring with 8:01 remaining while Quinton Howden was off for high-sticking Slava Voynov, who set up the goal. All 12 of Voynov’s points on the power play have been assists. Quick, who has spent his entire seven-year career with Los Angeles, signed a $58 million, 10-year contract extension in June 2012 — only 17 days after leading the Kings to their first Stanley Cup title and winning the Conn Smythe Trophy as playoff MVP. NOTES: Quick has won 47 games that were decided in overtime or a shootout. Vachon played in 66 games for the Kings that ended in ties. … Quick missed 24 games because of a groin injury, returning to action on Jan. 4. … Brown sustained an upper-body injury in the second period. … The Kings embark on a three-game trip through Philadelphia, Washington and Pittsburgh, trying to extend their five-game road winning streak.